We will follow the Dental Fee Guide which means no extra billing and no surprises for our dental patients. Calgary Dental Centers welcomes you to experience continuity of care. Dr. Hanif Asaria is a local resident, and a Canadian graduate, credentialed by the National Dental Examining Board of Canada. Dr. Asaria is a General Dentist. He is also member of the Canadian Dental Association and the Alberta Dental Association and College. He has spent his entire professional career since the graduation in 1989 attending to the oral health of Calgary families. By offering a broad range of services administered with a high standard of care, patients rarely need to be referred out to other providers. Calgary Dental Centers have easy access, with free parking, handicap spaces, and room for buses. We happily accept referrals from Blue Cross, and patients on welfare and social service programs. No charge for back-to-work sick notes. We follow the Alberta Blue Cross (ABC) fee guide. Patients have a familiar co-payment, with no surprises at billing and no overcharging. 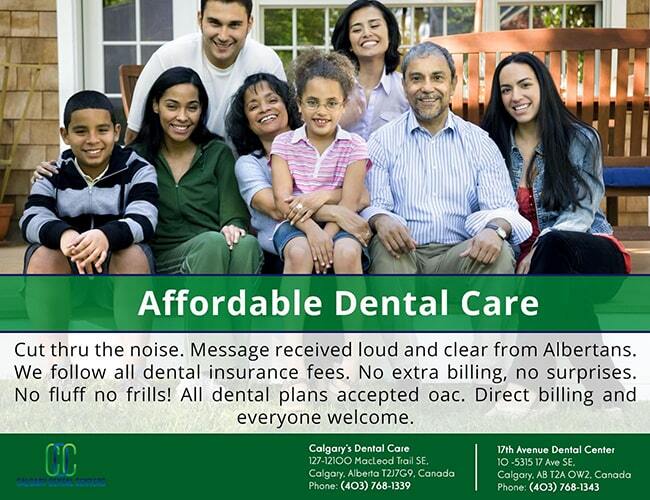 Calgary Dental Centers strive to make dental healthcare affordable for every patient. We develop customized treatment plans and accept financing through DentalCard from iFinance Canada. Patients are never left without a source of contact. Dr. Asaria is available on weekdays during office hours. After hours, calls are forwarded directly to our dental help line. We accept all Dental insurances!! !